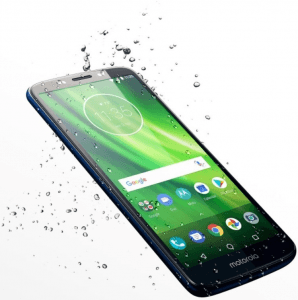 Also known as Motorola G6 Play, the Moto G6 Play mirrors many 2018-released mid-end contenders with its 5.7-inch screen real estate and 18:9 aspect ratio (720p definition), while it promises up to 36 hours (2160 minutes) of usage on a single charge with its robust 4000mAh battery. Besides, it also does not quite hit the mark with its 1.4GHz quad-core processor, which flounders in comparison to the eight-core chips used by some of its rivals. Also known as Motorola G6 Play. Pros and Cons Review Though the Moto G6 Play could have played around with an eight-core engine (instead of its quad-core 1.4GHz chip), specs like a 4000mAh battery and a 5.7-inch 18:9 720p screen still make it a viable mid-range Android. We unveil its other cons and pros here. (more) Latest Motorola See all the recent Motorola phones.